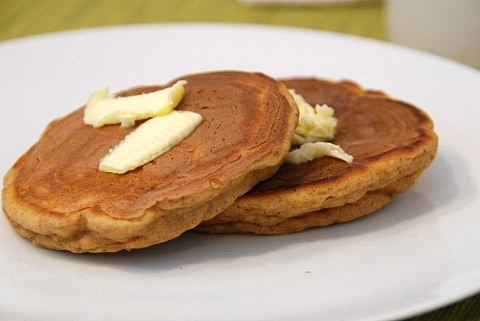 These are actually pretty similar to our standard pancakes, at least in composition. We ended up roughly doubling the recipe we found, and the texture and thickness were pretty similar. However, these were a bit chewier, so I might add a bit more milk next time we make them just to see if a thinner batter produces a more delicate pancake. All in all, though, quite delicious. We had them with butter and a sprinkling of sugar, but they would also be great with maple syrup. Quite a simple procedure, really. 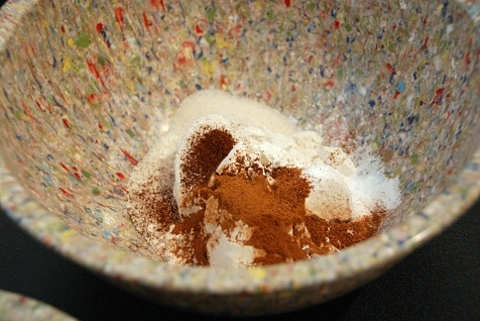 Combine your dry ingredients in a medium-ish bowl. (This picture is before we realized we needed to double the recipe — we discovered we had more pumpkin than we had thought. 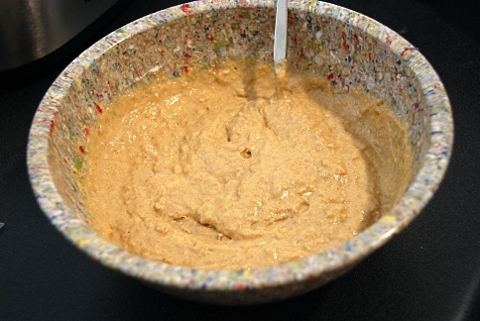 So you will find that you have about twice the amount of dry ingredients as is pictured below!) Stir or whisk them together so the spices are evenly distributed. 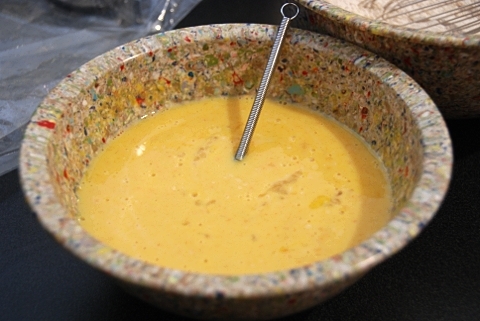 Combine your wet ingredients – pumpkin, milk, and eggs, in that order – in a large bowl. If you are going with canned pumpkin, it may be worth it to mush the pumpkin with the back of a spoon to smooth it out a bit before you add anything else. It won’t totally eliminate lumps but it helps somewhat. Then you can add the milk, try to get rid of more lumps, and when your milk/pumpkin mixture is relatively smooth, beat the eggs in last. Add the dry ingredients to the wet ingredients, pausing to incorporate as you go — I usually add the dry ingredients 1/2 to 1/3 at a time. Side note: You may notice that our wet bowl is smaller than our dry bowl; the original recipe suggested adding the wet to the dry instead of the other way around, and in the spirit of adventure I gave it a shot. But I have to say I prefer my way, so unless you are a die-hard wet-to-dry person (and if you are… please explain the benefits? I truly want to know), then I would go with adding dry-to-wet, as I described above. 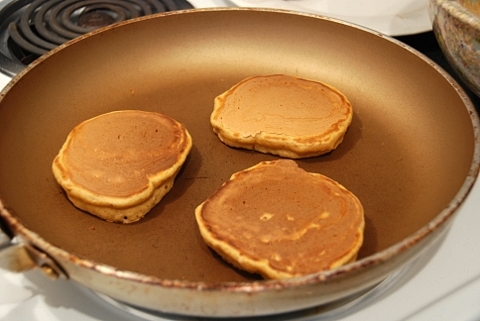 Heat up a skillet, and cook pancakes as usual. We use a very large nonstick skillet, and because it’s nonstick we don’t use oil or butter. But if you don’t have a nonstick pan, you may want to add a bit of oil/butter to help the pancakes come off more easily. We usually use medium-high heat for our pancakes. The first side will usually take 1-2 minutes, then flip (you can tell it’s about time to flip when there are bubbles rising to the uncooked surface of the pancake), and cook the second side for about the same amount of time. I think this recipe made about 12-14 good-sized pancakes. Enjoy! So glad to hear that! 🙂 Merry Christmas, I wish I could have been there to celebrate with you yesterday! 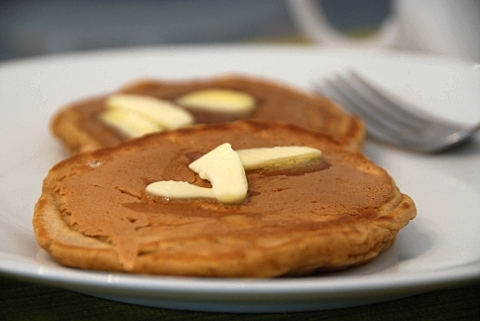 You are currently reading Pumpkin Pancakes at Nombudsman.